Day 01 September 27 Saturday Arrive in Yangon. 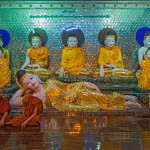 Day 02 September 28 Sunday Introductions, insights to Myanmar and photography sessions in the morning. Riding the circular train through the suburbs of Yangon in the afternoon. 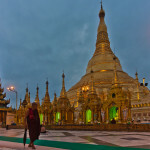 Evening visit to Shwedagon Pagoda. 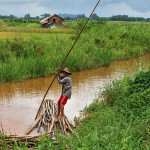 Day 03 September 29 Monday Fly to Inle Lake. 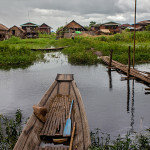 Walks and short drives in the area around Inle Lake. Day 04 September 30 Tuesday Dawn to dusk boat ride on Inle Lake, visiting floating villages, floating vegetable gardens, monasteries and markets. Day 05 October 01 Wednesday Fly to Bagan. Visit to the well-known ancient temples of Bagan Area. Sunset photography of the Pagodas of Bagan. Day 06 October 02 Thursday Sunrise and sunset photography of the expanse of Pagodas. Relatively free day and independent photography during the day. Day 07 October 03 Friday An air-conditioned boat ride (full-day) on Ayeyarwady Rivere to Mandalay. Day 08 October 04 Saturday Morning visit to the giant Mingun Pagoda. Visit Mahagandayon Monastery later in the day. Sunset at U-Bein bridge at Amarapura. Day 09 October 05 Sunday Tour ends after breakfast. 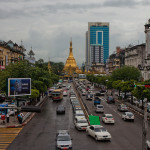 The excitement begins today as you arrive in Yangon. It’s a day to check-in to your hotel and relax after a long journey. 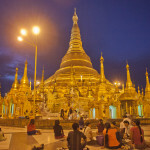 If you have arrived early, you may want to explore your surroundings of Yangon. In any case, there is always some excitement on the streets and you are never too faraway from a Pagoda no matter where you go! We start the day easy after breakfast, but we highly recommend an early morning stroll in the streets of Yangon, which gets you started on Myanmar and gives a glimpse of what is in store in the week ahead. After breakfast, we get together with the lead photographer for a round of introductions, get a briefing on the places we see in Myanmar and the photography opportunities that await us. 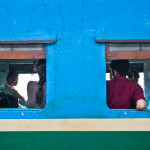 Later, in the afternoon, we head straight to the countryside with our camera, seated inside a fifty year old railway coach that circles the suburbs of Yangon. It’s pretty eventful inside the coach as villagers in longyis hop in and out with their purchase from the market or with the stuff they are hoping to sell. Vendors hop in and out too, with grapefruits, cut watermelons or even quail eggs in their basket. 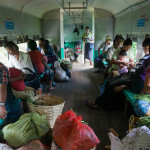 Passing through the window are train stations with colonial looks, stations adjoining markets, endless grasslands, villages and pack of crowds as we make our way back to Yangon. It’s a train ride that seems too charming to be true. 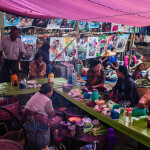 Our photojourney, however, would have begun well before we even board the train, as we photograph the casually strolling porters and vendors on the platform. The uncrowded platforms have a sort of industrial-shed look where the arriving and departing trains make good photo ops. Once we come back, we head towards the most celebrated structure in all of Myanmar — the Shwedagon Pagoda — covered with many tonnes of gold. The bright Pagoda glitters in floodlight so strongly that, for a moment it even seems to light up the sky! Later, optionally, you can head to Sakura Tower – the tallest building in the city for a bird’s-eye-view of the Pagoda complex glowing in the night as you enjoy your dinner! 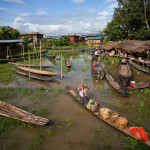 We fly out of Yangon into the magical world of Inle Lake today, where we have a glimpse of tropical life waiting for us. Endless paddy fields in shallow marshes, people in conical hats working in the fields and villages on stilts.. just a few things that are quintessential South East Asia. Later in the day, we spend time walking/driving in the Inle Lake region photographing this tropical landscape, people and the villages. It gives us a glimpse of life in the heart of Myanmar, but the true excitement will be waiting for us the next day. 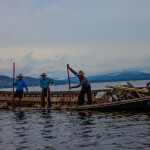 Inle Lake is a gigantic waterworld that your cameras certainly will love. 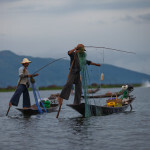 The most well-known in Inle are the Intha fishermen who fish with both hands and simultaneously row their canoe using their legs. We may also see Intha people pulling out weed from the lake, which will serve as a base and fertilizer for their floating tomato gardens. 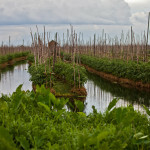 Yes, they are vegetable gardens on the lake growing on a floating base of mud and weed, held in place by tall bamboo sticks. If the leg-rowing and floating gardens did not impress you enough, let’s take you to entire villages on the lake built on stilts. They are full-fledged settlements with many houses, monasteries, post-offices, electricity and even restaurants. Of course, one thing that you can’t ask for are the roads! These places can only be approached by boats. Thriving on the lake are also markets that gather in different parts of the lake, taking turns. Each day, the market shifts to a new place until it returns to the same place on the 6th day. 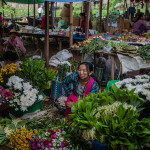 These are places where different tribes in the mountains around Inle gather to sell their produce and buy things they require. Pretty colourful these markets are, as you will notice. Imagine that you are flying over mountainous landscape, enjoying the views from a place high above the peaks. Now imagine a miniature version of beautiful brown mountains over a large expanse of land, and what you have there is Bagan. Over 2000 temples or pagodas are squeezed into the plains less than a 100 square kilometer, many of them seen in dense packs rising over the green plains when you watch from the top of a tall pagoda. 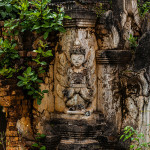 While some are of historical significance and some have continued to be places of worship, they make a magical visual as a collective during sunrise and sunset hours. If there is one thing that we would pick as the ultimate experience of Myanmar, it is the view of sunrise and sunset over Bagan. Day 07. River trip from Bagan to Mandalay. We make a very different kind of journey today. Instead of taking the road or flying from Bagan to Mandalay, we cruise upstream over Ayeyarwady River. It will be an air-conditioned boat that makes a full-day trip over the largest river in the country and a lifeline for much of Myanmar. We reach Mandalay sometime in the evening and check-in to our hotel. You can freely explore the streets of Mandalay early in the morning. After breakfast, we take a boat on a trip further upstream to Mingun on the right bank of Ayeyarwady. At Mingun is a gigantic pagoda, if finished, would have easily dwarfed the largest of the ancient structures existing in Myanmar today. Later, we will visit the well-known Mahagandayon Monastery and then spend the evening hours photographing U-Bein’s bridge across Taungthaman Lake. It’s the longest wooden bridge in the world, and is a great place for making silhouette images of people on foot and bicycles moving across. We end the day with a discussion on the visual experiences we had in Myanmar so far, reminiscing the journeys we made through the week and the photography opportunities we encountered. Day 09. Checkout after breakfast. 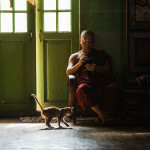 It would have been a cherished and beautiful photographic journey across Myanmar. We head back to our homes today, with plenty of learning and insights on photography that we carry with us and of course memory cards filled with some of the finest impressions that you would have ever made. Write to us at contactus@gypsyfeettravels.com or call at 9954218653 for further details including cost.